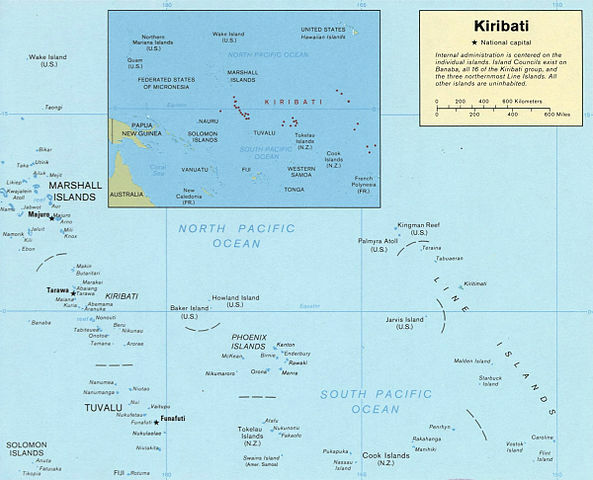 When you first see Kiribati on a map, it’s a little confusing. The International Date Line curves back on itself to include Kiribati’s 33 islands among the first countries to see the sun. Kiribati lies right where the International Date Line crosses the Equator, but it is also at the centre of another collision between climate change and migration. Kiribati, with a population of just over 100,000, has been pinpointed as one of the first countries that will be submerged under water as sea levels continue to rise. Its government is already making plans for its people’s escape. The sea level around Kiribati has risen between 1 and 4mm per year for the last 20 years. Although other island nations are experiencing higher increases in sea levels, Kiribati’s coral atolls have a harder time adjusting to these changes, and cannot keep up with the seal level rise. All but one of Kiribati’s islands are atolls – these are ring-shaped islands formed from coral, and the tallest peak across the islands is only 3 metres. They don’t stand a chance against an 8 metre wave. As if sea level rise isn’t threatening enough, Kiribati’s surrounding ocean is also becoming more acidic, preventing the coral its people live on from constructing its skeletons and keeping them above sea level. The increased acidity also threatens the balance of the local ecosystem, and is making it harder to grow crops and maintain livelihoods. 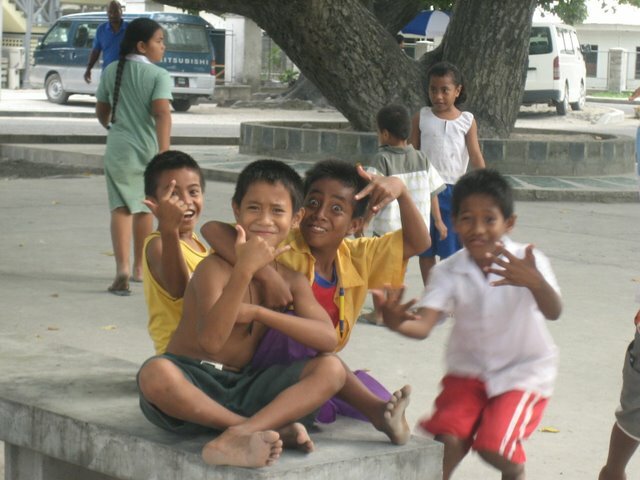 When the tide is out, the I-Kiribati (the people of Kiribati) live in a Pacific paradise. But at high tide, those living nearest the beaches hold their breaths and prepare for the onslaught. Families have built walls higher and higher to protect against the rising tides, but maintaining them is a daily task. Following the 2011 earthquake in Japan, the I-Kiribati heard about the ensuing tsunami and braced for the worst. Many climbed up coconut trees, not having any higher ground to escape to. Luckily the tsunami never hit. 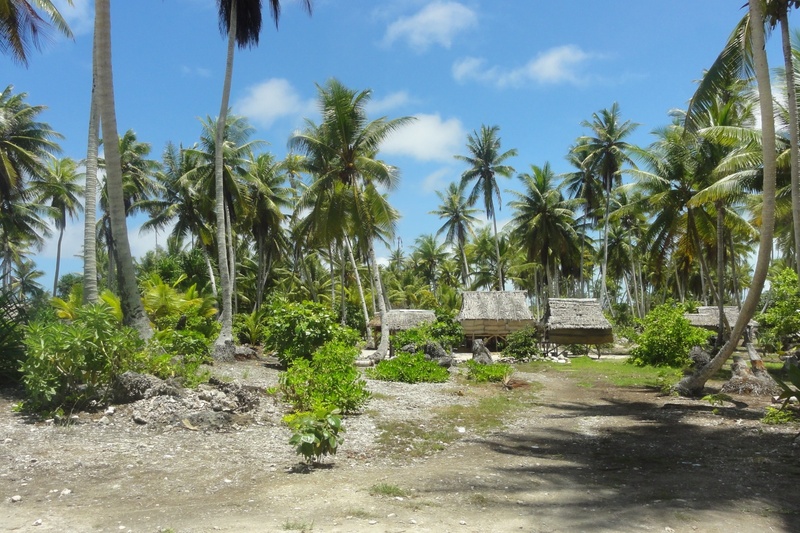 Experts predict that Kiribati can only remain inhabitable for about another 50 years. Kiribati’s government knows its people can’t seek refuge in coconut trees forever, which is why they’ve come up with an escape plan. All they need now is the funding to make it happen. 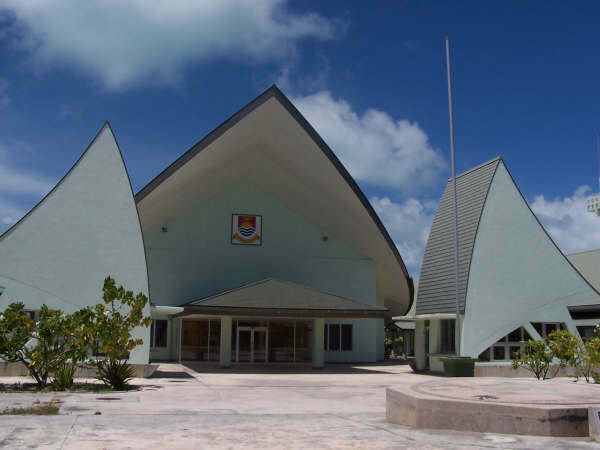 The Kiribati government explains in its climate change action plan that “with very little fossil fuel use and high susceptibility to climate effects, Kiribati is much more focused on adapting to rather than mitigating climate change”. To put it frankly, they are focused on planning how to protect their people against a climate change that they largely did not cause and cannot prevent, while other countries who have a greater responsibility and suffer less choose to do very little. In 2005, for example, Kiribati’s CO2 emissions were lower than any country except one. In the same year, their emissions per capita were only seven percent of the global average. The unfairness is stark. The climate change action plan has three parts: mitigation, adaptation and, eventually, relocation – because moving the I-Kiribati is simply inevitable. While the government does its bit to mitigate climate change by using low-carbon technologies, this does more for the economy’s development than for climate change mitigation. The taxpayers’ money is better spent on short-term climate change adaptation and long-term relocation. The government’s action plan acknowledges that “relocation of our people may be inevitable. It would be irresponsible to acknowledge this reality and not do anything to prepare our community for eventual migration in circumstances that permit them to migrate with dignity”. In 2011 the search for solutions began. At first President Tong presented the idea of constructing man-made islands like oil rigs for people to live on. By the following year he was negotiating to buy land in Fiji for the I-Kiribati to slowly migrate to. But this plan hung on finding funding from the international community – particularly those driving climate change. "We don't want 100,000 people from Kiribati coming to Fiji in one go," he said at the time. "They need to find employment, not as refugees but as immigrant people with skills to offer, people who have a place in the community, people who will not be seen as second-class citizens. For now the government is focusing on an education program that can cultivate a workforce skilled and ready for foreign labour markets. The government has set the goal of raising tertiary education standards to the same level as those in Australia and New Zealand in hopes of turning out attractive migrant workers. If the I-Kiribati do manage to have their new land funded, maintaining a sense of culture will be crucial in their new home. There is hope that those who are already interested can begin migration soon, so expat communities can be established, ready to absorb greater numbers in the long-term. Meanwhile, the waves continue to roll in.